Age of Empires HD and Rise of Rome HD are large updates for the original Age of Empires game and its expansion Rise of Rome. Best of all, it is free and available now! To play, Download Voobly then join the Age of Empires Lobby for Age of Empires HD or join the Rise of Rome Lobby for Rise of Rome HD and Voobly will automatically upgrade your game. The key features include upgrading the game engine to support modern resolutions, including high definition resolutions 1920×1080, and widescreen displays (the original versions only supports up to 1024x768 resolution). Along with many other features. This update builds on the work we have done over the past 7 years at Voobly. If you are available to help out improve these games and work with the community and unite it, please get in touch with Elusive. Our goals are to add new features, fix bugs, and provide the community with much needed support that it isn't getting anywhere else. 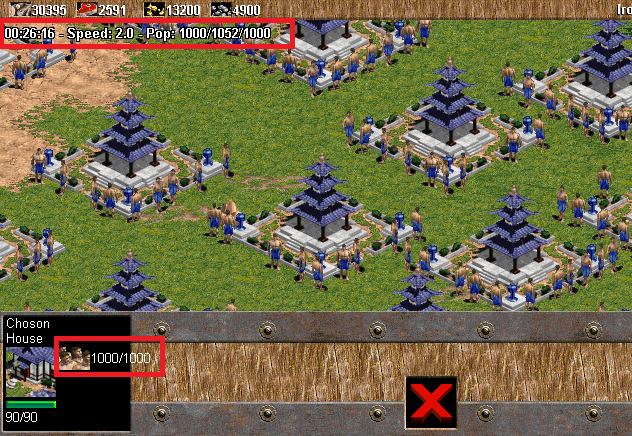 If you background with AoE/RoR modding we should work together. High Definition Resolution - Full HD and widescreen resolutions are available. 300 - 1000 Population Limits - You can select population limits up to 1000, including 300, 350, 400, 450, 600, 900, 1000 limits. 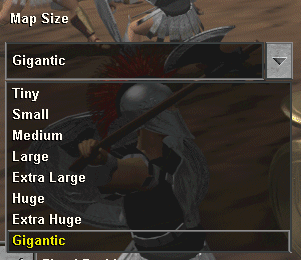 New Map Sizes (AoE only) - You can select gigantic map sizes (60% more playable area than huge!) and a new map size between large and huge called "extra large", another map size extra huge is added between huge and gigantic. 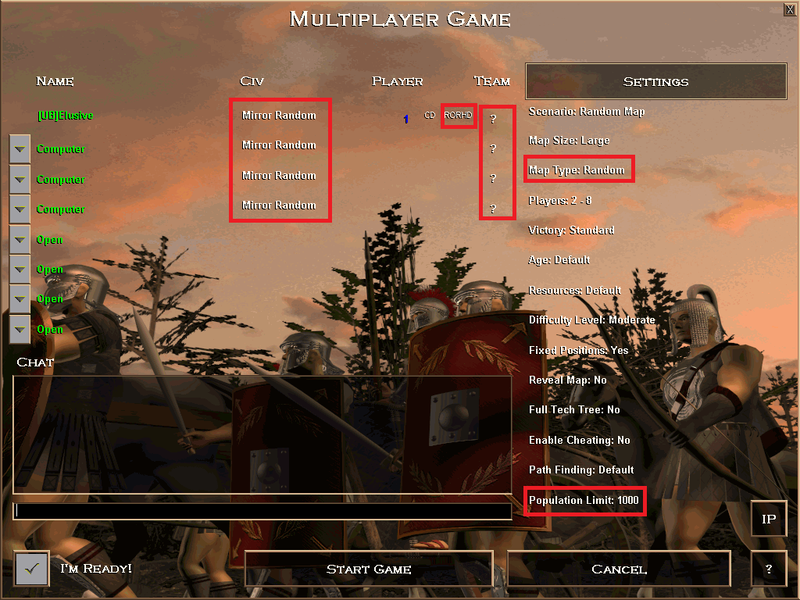 Random Civilizations - You are able to select "random civilization" where a random civ is selected each player in the game gets a unique civ chosen at random. Mirrored Civilizations - This option allows each team to receive the same civilizations as the other team, providing a more even match up in your game by eliminating the possibilities of having a team with all weak civilizations. So, e.g. : in a two vs. two the civs that are chosen might be Minoan and Greek and each team will have one person as Minoan and Greek. Random Teams - When you select ?, the game will randomly match up the players on each team to make it 1v1,2v2,3v3,4v4,etc. 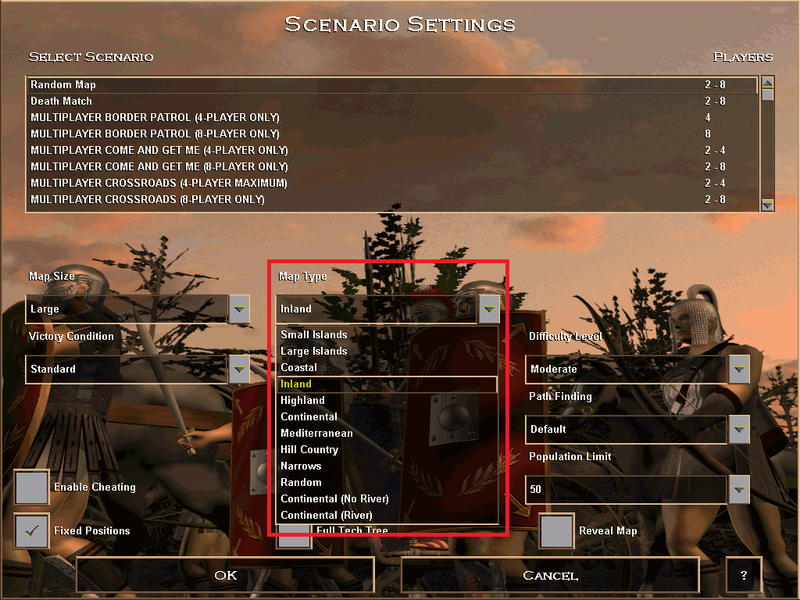 Random Map Type - Instead of having to choosing a map type (Small Islands, Highland, etc) you can now select "Random" and a map type will be chosen at random. 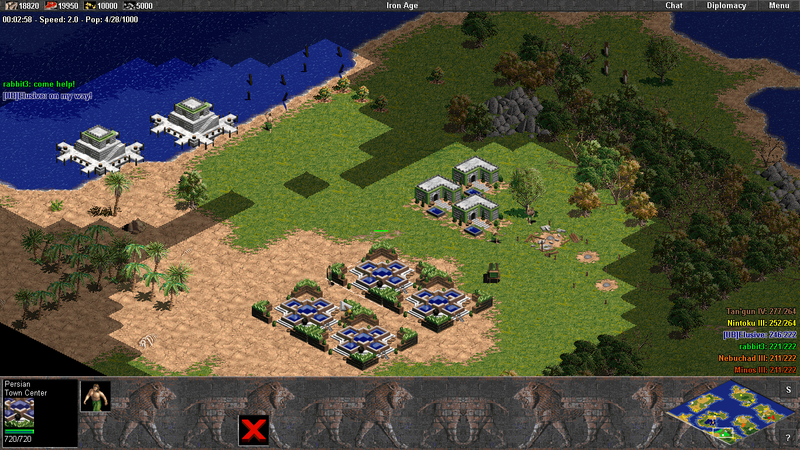 Age of Empires HD: You can now choose highland with rivers (shallows) and without. This fixes a major problem many users faced with deathmatch games. Rise of Rome HD: You can now choose continental with rivers (shallows) and without. Colored Chat Text - chat text will show in the color of the players name. 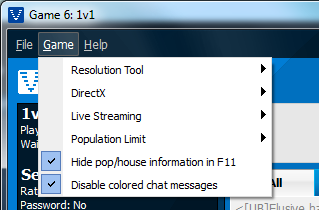 Population Overlay - pop/houses/poplimit now shown in F11 status text so you don't need to continually check houses. 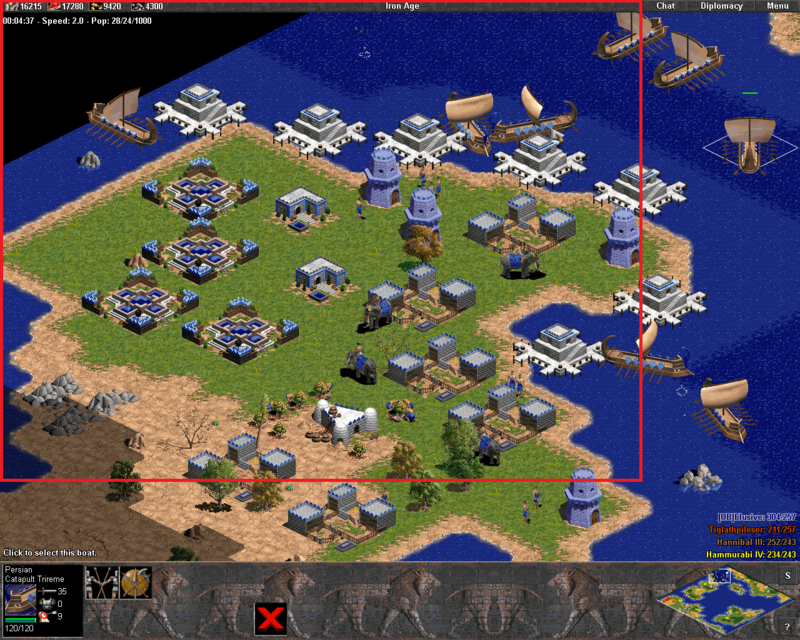 Window-Mode - It is possible to launch in window-mode, simply click the "Game" button in your game room and select "Directx" and check the "Render in 32bit color" and the "Start in window-mode". Full HD and widescreen resolutions are available. For more information read the Widescreen and Multi-Monitor guide. The following screenshots have the original game's max display resolution (1024x768) marked with red lines. If you have multiple screens you can now enable the multi-monitor support on Voobly and the game will span across all your screens. 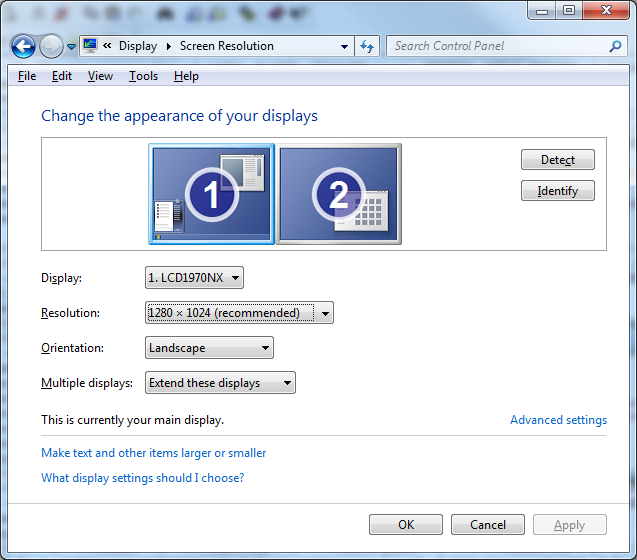 The only requirement is that you set your the monitor on the left as the primary display within Microsoft Windows display settings. 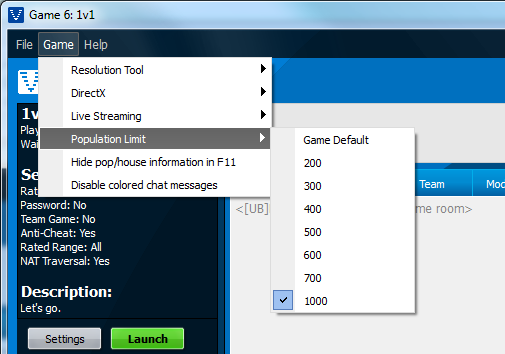 You can select population limits up to 1000, including 300, 350, 400, 450, 600, 900, 1000 limits. You can select gigantic map sizes (60% more playable area than huge!) 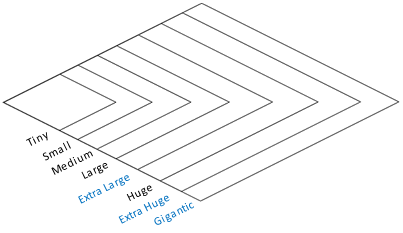 and a new map size between large and huge called "extra large", another map size extra huge is added between huge and gigantic. 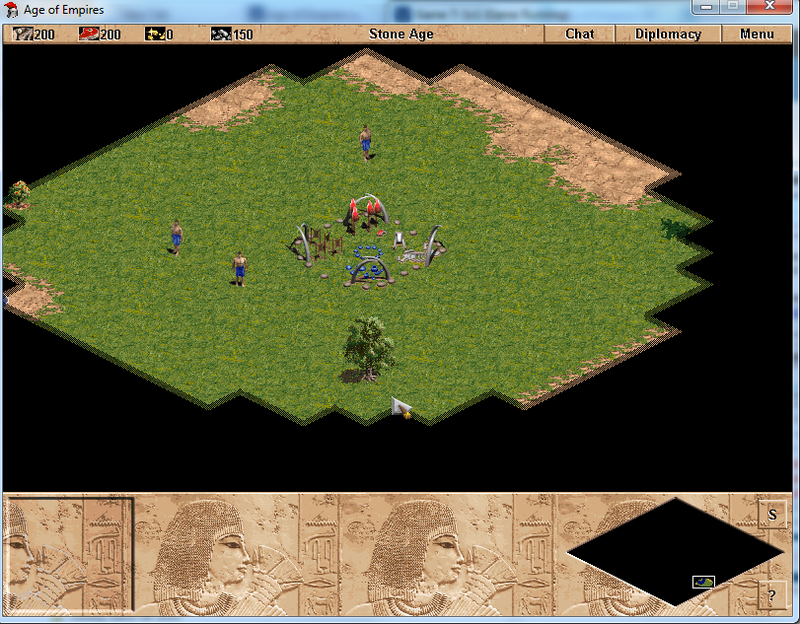 The diagram on the right shows the relative size of AoE maps. 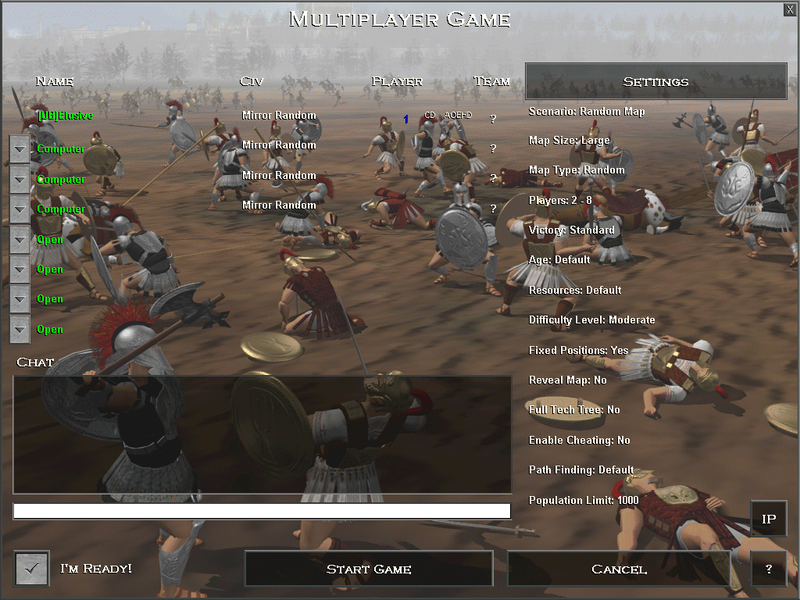 Here is another view, that shows playable area per player in game. Cells with red border is what was possible before, cells with blue background shows what you can do now. Notice it's more consistent for playable area for 4v4 and 2v2. 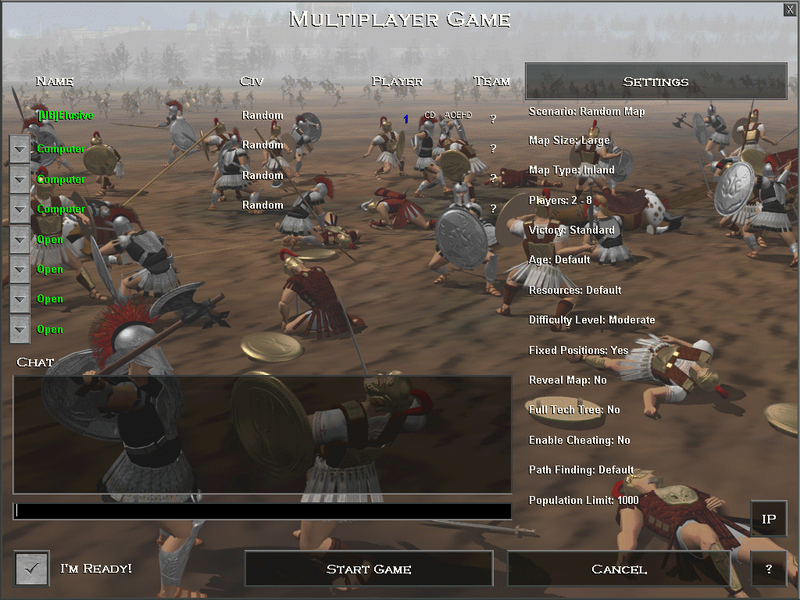 You are able to select "random civilization" where a random civ is selected each player in the game gets a unique civ chosen at random. 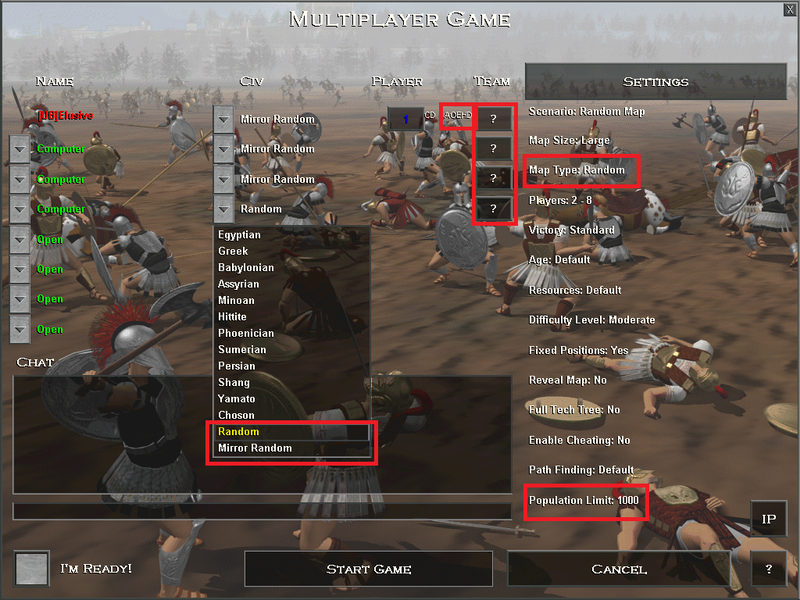 This option allows each team to receive the same civilizations as the other team, providing a more even match up in your game by eliminating the possibilities of having a team with all weak civilizations. So, e.g. 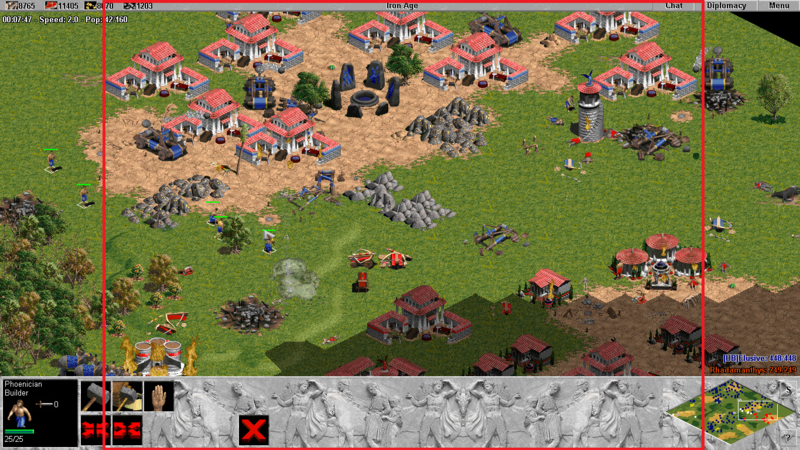 : in a two vs. two the civs that are chosen might be Minoan and Greek and each team will have one person as Minoan and Greek. When you select ?, the game will randomly match up the players on each team to make it 1v1,2v2,3v3,4v4,etc. Instead of having to choosing a map type (Small Islands, Highland, etc) you can now select "Random" and a map type will be chosen at random. 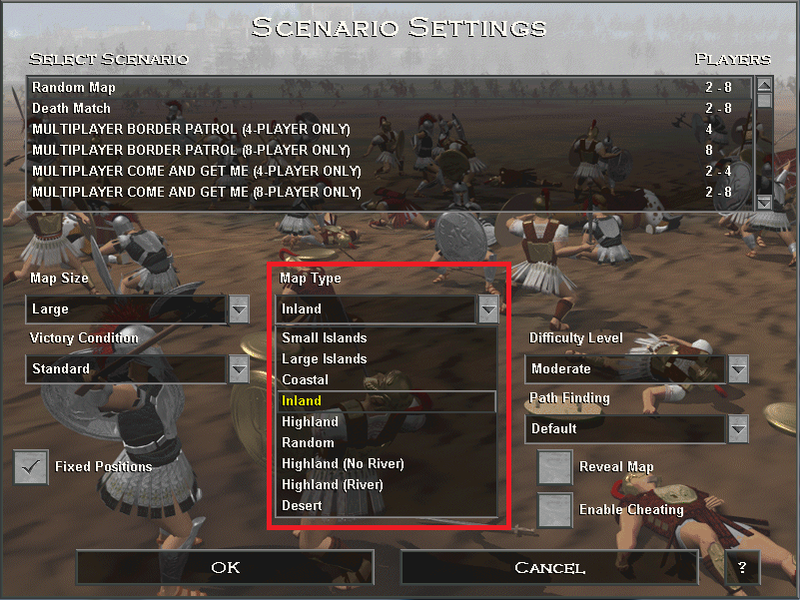 You can now choose highland with rivers (shallows) and without. This fixes a major problem many users faced, especially with deathmatch games. Desert - no resources, spend what you have wisely (this map type is not included as part of map type: random). You can now choose continental with rivers (shallows) and without. Chat text will show in the color of the players name. You can choose to disable this feature through the game menu. Pop/# of Houses/Poplimit now shown in F11 status text so you don't need to continually check houses. 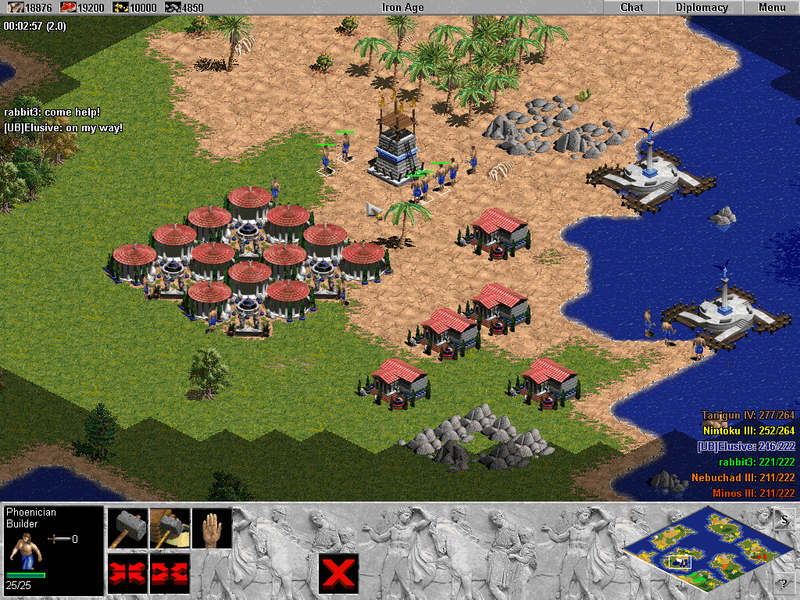 This feature is only applicable to Age of Empires HD. It is possible to launch in window-mode, simply click the "Game" button in your game room and select "Directx" and check the "Render in 32bit color" and the "Start in window-mode". 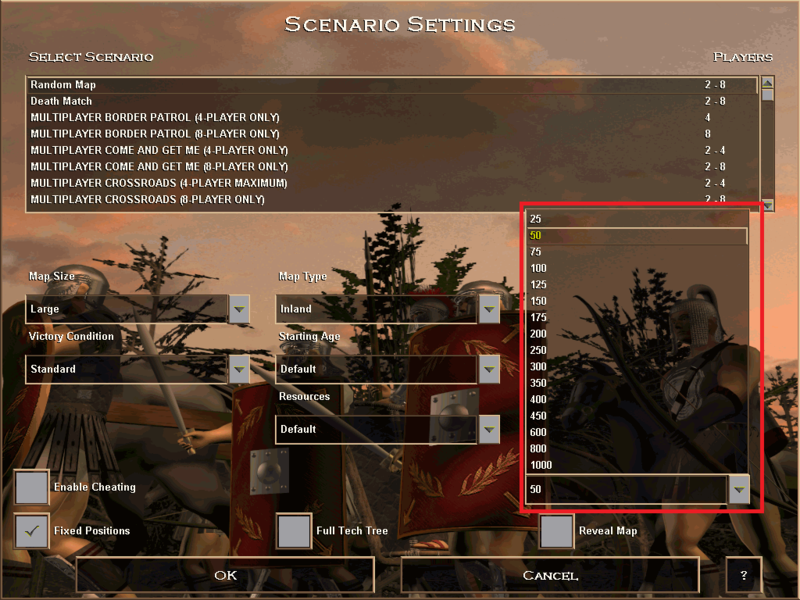 Voobly supports both Rise of Rome 1.0a and Rise of Rome 1.0 in HD. 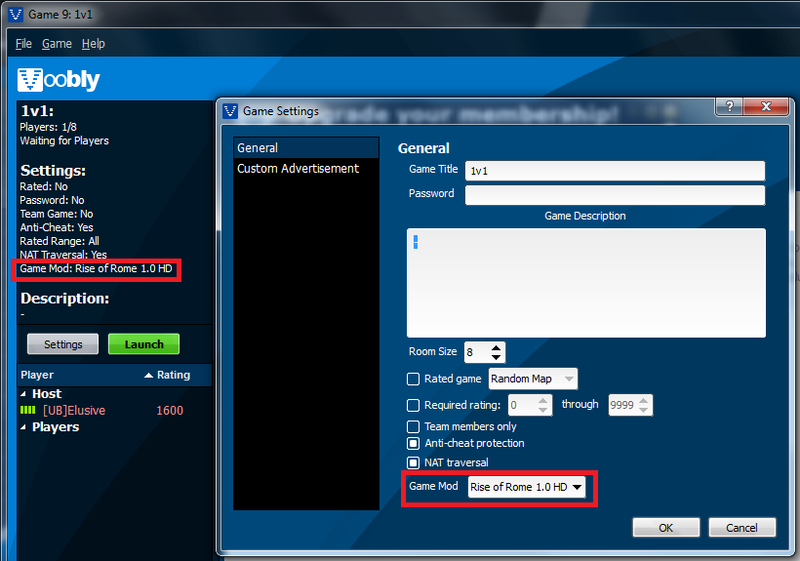 To change between 1.0 and 1.0a you use the game mod option in the game room settings. 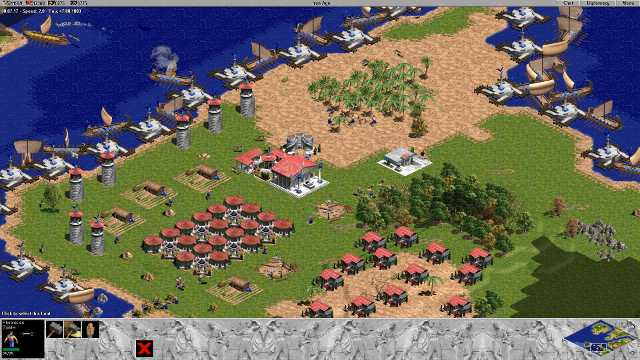 Voobly is proud to introduce a brand new Spectator Mode for AoE1 & RoR! Just right-click on the player(s) that you wish to be spectators, and select the option ‘spectator’. 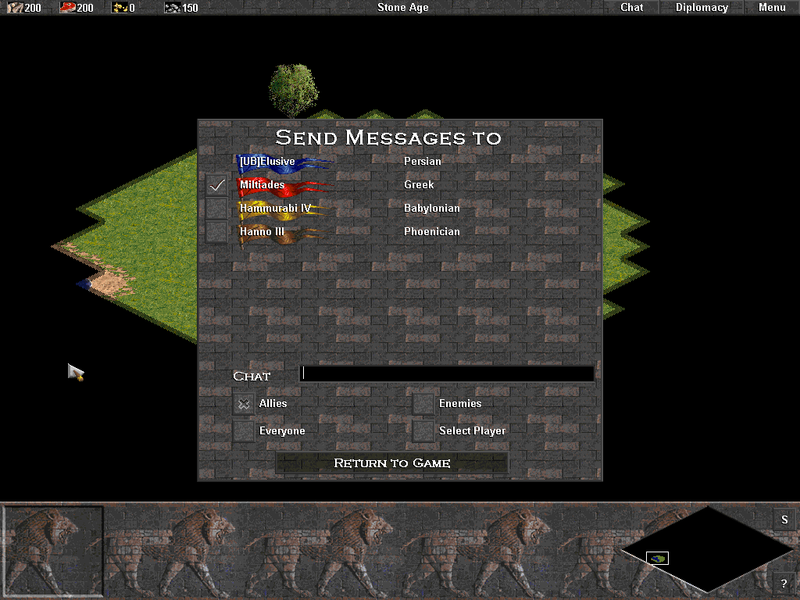 When a player has been selected, an eye will appear besides their name, indicating they will be a spectator within the game. To remove a player from spectator mode, just deselect the same option. If you experience more crashes than normal it is recommended you turn off and not use any new features in the patch (e.g. : new map types, random civs/teams, population limits, etc) and see if that helps -- if it does narrow in on which feature is causing you trouble and report to a Voobly staff member. Population especially as using higher populations can worsen pre-existing bugs in the game.